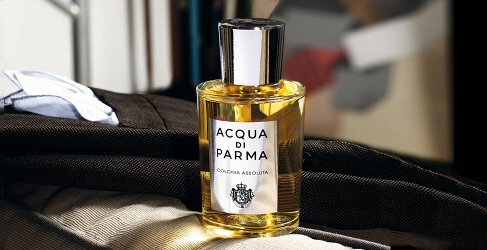 Acqua di Parma launched Colonia Assoluta in 2003. It is a unisex fragrance, created by Jean Claude Ellena and Bernard Duchaufour, and features notes of orange, bergamot, verbena, cardamom, pink pepper, pimento, jasmine, ylang ylang, rose, wild orchid, cedar, aromatic Thai resins, patchouli, white musk and amber. The "he" below is Marlen, one of the moderators on the basenotes forum, joining me for our third joint review. He Says: One of my favorite warm weather scents, Colonia Assoluta offers a refreshing and refined bouquet without resorting to employing currently popular notes of tea and grapefruit, and without any ozone or marine accords. What Colonia Assoluta does offer is a sparkling and seemlessly blended eau de cologne with both a refreshing and pleasant sillage and better than average lasting power. On my skin, none of the individual notes are ever emphasized though the fragrance transforms ever-so-subtly into a slightly warmer white woods scent in the drydown. A total pleasure to wear in all its stages, there's just something so right about this sophisticated scent for warm summer days. She Says: I should start by saying that I have never cared for the original Acqua di Parma Colonia, which smells nice in the bottle but turns bitter, soapy and harsh on my skin. Colonia Assoluta starts off nicely with peppered citrus notes and lovely undertones of cardamom. I would swear there is a hint of cumin as well, but perhaps I am getting paranoid about cumin. At any rate, the top notes are sparkling and light and summery. As it dries down, the fragrance changes gears entirely. The citrus and spice notes fade into a flat woody-musky scent with light florals. I agree entirely with Marlen that individual notes are not emphasized: I don't smell rose, or jasmine, or ylang. It just smells dull and rather nondescript. It has more depth than the original Colonia, lasts longer, and has none of Colonia's harshness. If given the choice between the two, I would pick Assoluta over the original Colonia. But I would rather not wear either. Colonia Assoluta is an Eau de Cologne. For buying information, see the listing for Acqua di Parma under Perfume Houses. Thanks for the review, R. For once, I'm agreeing with Marlen! As I mentioned about Iris Nobile the other day, I find IN kind of soapy, yet I don't with CA. It's one of the few cologne-y scents that work on me – light and sparkly but with unexpected warmth – and I woud have bought it but for H's nose-wrinkling (he thought it was too perfume-y!). NST, I was just about to say to Gert 'let's try it, why don't we' and then you said you'd rather not wear it. I love the aesthetics of the packaging and I heard rumors about Cary Grant, so I once sampled Acqua di Parma for a week straight to make myself learn to love it. Didn't happen. It is harsh and bitter on my skin. Might be the bergamot acting out on me again. I am now completely over AdP in any form. At least I can now add AdP to my short list of common ground with you. N, I just ignore nose-wrinkling, or I'd be limited to one or two fragrances! Who knows, Gert might love it! K, I love the packaging too. Very classic. And love the yellow boxes too. You could be right. She's a contrarian, that one. K, Poor Bernard Duchaufour, LOL! He made my much loved Calamus so I won't hold this against him. I love cypress — too bad about the Cipresso di Toscanna. Haven't tried it yet. there are always so many reasons i want to love a perfume, other than the obvious olfactory ones. “mechant loup” for it's killer name, “jean reno loves you” so i can bite my thumb at the rest of the french-speaking world, and now, it seems i'm not alone in having wanted to love “acqua” for it's packaging. i did not love it, i'm sad to admit, since i ended up with an expensive (duty free or not) bottle. i found that after a mere hour of citrus glory, it faded on my skin into a cross between jean-nate and popcorn. i know!! popcorn! what gives? anyway, i feel betrayed enough to not try “colonia assoluta” until i get a free sample. enter lacan. The packaging is so nicely done, and it definitely made it easier to buy Iris Nobile. But Jean Nate & popcorn, LOL! That is not appealing. R, you know I love these he said/she said features. Always a good read, thanks both of you. Assoluta is my favourite amoung colonias. I like the drydown very much. And what I don't understand is how those two very charismatic perfumers could work together on one project. It's like to ask two poets write one poem. It does seem odd. Perhaps one of them started it & the other finished it…that does happen from time to time for various reasons. This one is not unimpressive, from what I’m experiencing from my sample. Smells like a possible future signature note. Might have to try Intensa too. I like Intensa better than either of these — it’s worth a shot! Great review! I think both viewpoints actually reflect my opinion. Colonia Assoluta would be wonderful on a man, because it is uncommonly fresh and light for many men’s fragrances. But for me, personally (from the female point of view), meh. For women, there are lots of lighter and fresher things out there, and the other components in the fragrance don’t make it unique. For some reason, it makes me think of a masculinized version of Fresh Lemon Sugar. I think I heard a rumor (nothing more) that it was to be discontinued? I do think they did a better job on the Intensa.